Argentina's stand-in captain Juan Martin Fernandez Lobbe has demanded his Pumas end their European tour on a triumphant note against Ireland tomorrow. The South Americans have turned their gaze to the future following their heroics at the World Cup last autumn, when they finished third. 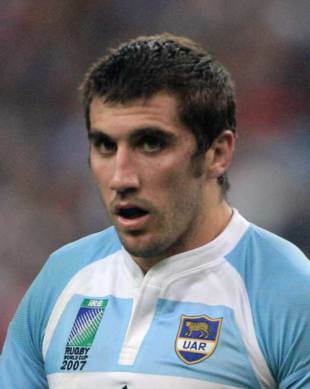 Only six survivors remain from the side that thumped Ireland 30-15 in the final group game and Fernandez Lobbe, who will captain the Pumas at Croke Park in the absence of Felipe Contepomi, insists it is time to move on from the World Cup. The Pumas have struggled for form under their new coach Santiago Phelan, who took over after the World Cup, and only ended a four-game losing streak with a 22-14 win over Italy in Turin last weekend. And Fernandez Lobbe added, "The World Cup was amazing but it's over. This a new team with new coaches. It's very important for us to now focus and start building the game, knowing that we have to work hard. "We've played Ireland so many times in recent times years. It's good as they're a great team. They do all the basics very well. I think it's going to be really good to play at Croke Park in front of 80,000 people. "It's going to be physical like every rugby game. I played against Munster this year and it's going to be pretty similar. They like having good and quick phase with the forwards and then having all the backs to play around. Their fly-half Ronan O'Gara is really good at game planning. He will want to play in our half and use the kicking strategy."